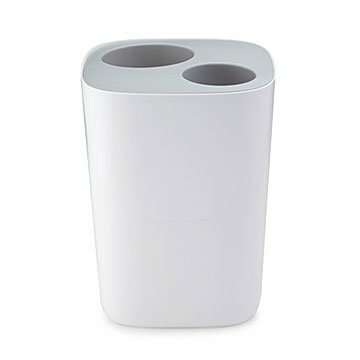 This compact, two-compartment bin helps you separate bathroom trash from recycling with sleek chic. Just about everyone has a recycling setup in the kitchen, but bathrooms are too small for that. This compact bin, in just the right size, can help eliminate the nagging guilt you feel when you throw out shampoo bottles. It has two compartments, one for trash, one for recyclables. Two different sized openings, one for each compartment, make it easy for even little kids to know which is which. The smaller compartment is actually a bin within the bin.To empty it, just lift it out. Both sections can be used lined or unlined. A simple but brilliant idea, executed with impeccable design. Made in China.